Ok, I love Peanut Butter Cups, so I couldn’t resist this Edible Christmas Craft. 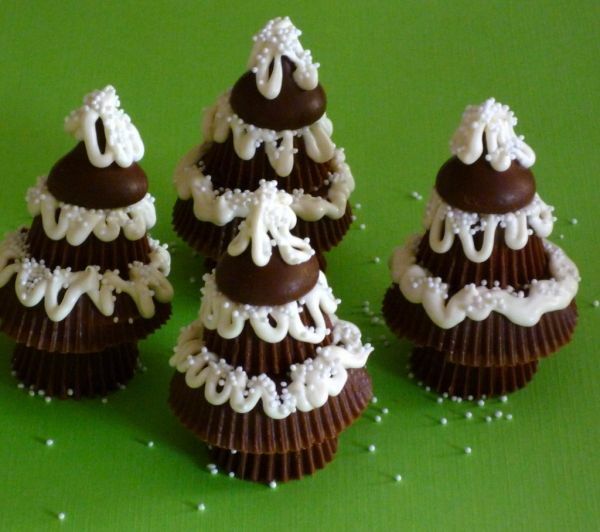 Here Sweet Simple Stuff shows you how to take my favorite candy, Reese’s Peanut Butter Cups and transform them into these adorable Christmas Trees. 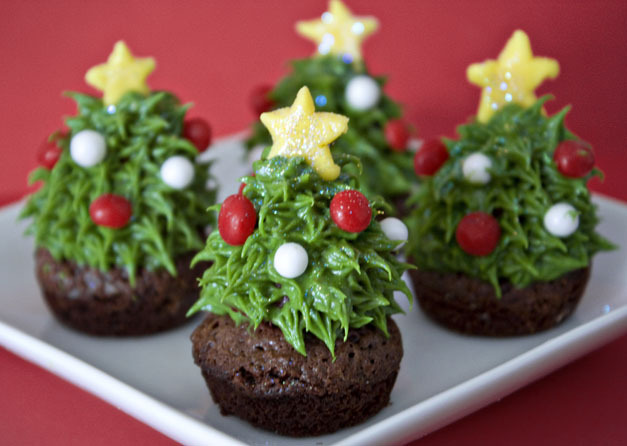 This edible Christmas craft is so cute!! Busy Bee Kids Crafts shows us how to take marshmallows, white icing, chocolate chips and a straw and create an adorable Sipping Snowman that is delicious!! It would taste so good in some hot chocolate. I love these crazy pair of penguins!! And, I bet they are delicious. I found this edible Christmas craft over at Spoonful. 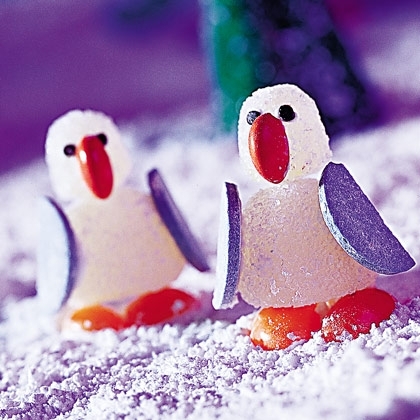 Not only will your kids love making these gumdrop penguins, but they will absolutely love eating them too. What a yummy and clever idea. Kaboose gives us all the details how to take store bought cookie dough and some Lifesaver hard candies and transform them into these beautiful Stained Glass Cookie Ornaments. Sure, you could just eat the cookies, but imagine how wonderful they would look on your Christmas tree. 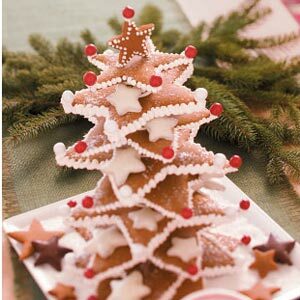 I love how beautiful this Gingerbread Cookie Christmas Tree looks. But, imagine how your guests at your Christmas party will enjoy this. They can simply grab a cookie off the tree and nibble on it while they chat with the guests. How fun!! Check out Taste of Home for the details. Oh this garland looks so beautiful!! 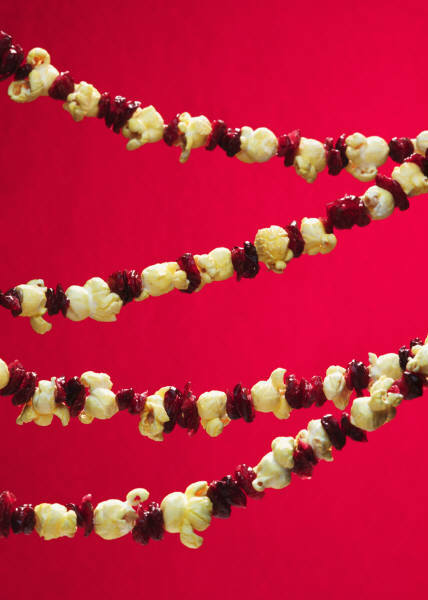 I love how the colors of the red cranberries contrast against the white popcorn. It’s just wonderful. Craft Elf shows you how you too can do this. This edible Christmas craft takes you back to a simpler time. And, it makes the Christmas tree just absolutely gorgeous. I’ve actually had this at a Christmas party before and it is absolutely delicious. And, it is so cute. Kraft will show you in great detail how to make this edible Christmas craft for your guests. 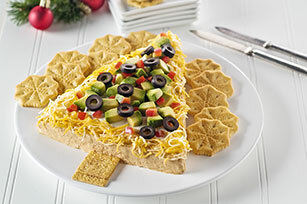 This fiesta spread is decorated like a Christmas tree…. so colorful too. 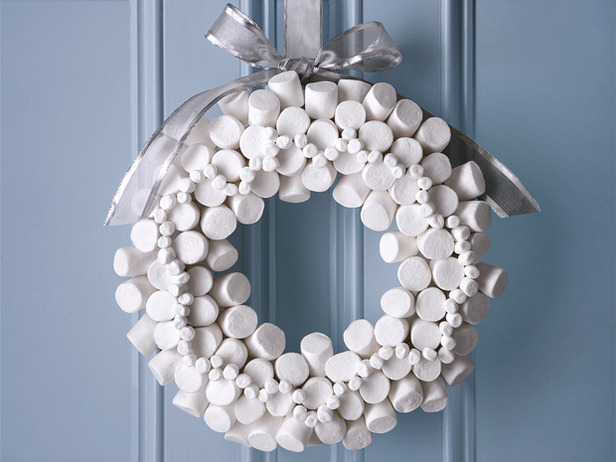 Who would have thought marshmallows could look this beautiful as a wreath? But, it truly does. It reminds me of a Winter Wonderland. I found this beautiful wreath at Three Pugs & a Baby. She explains how the Marshmallow Wreath only takes about 30 minutes. Can you imagine creating this beautiful wreath in just a half hour? How wonderful. 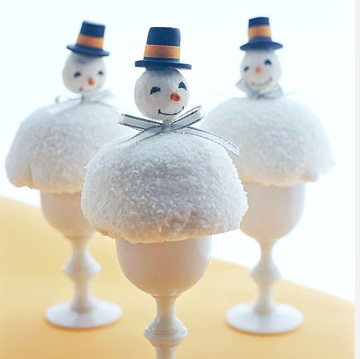 Better Homes & Gardens shows us how to take Hostess Snowballs and transform them into these cutie-patootie Snowmen Treats. 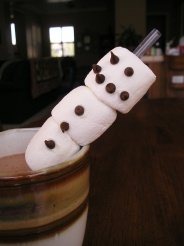 What child wouldn’t love eating this snowmen? They are just precious…. and I bet absolutely delicious too. I love, love, love the beautiful colors of this wreath. And, I would imagine the people at your front door will too. A Pretty Cool Life shows you how to make this beautiful Christmas Wreath in great detail. If you aren’t crazy about all the colors…. 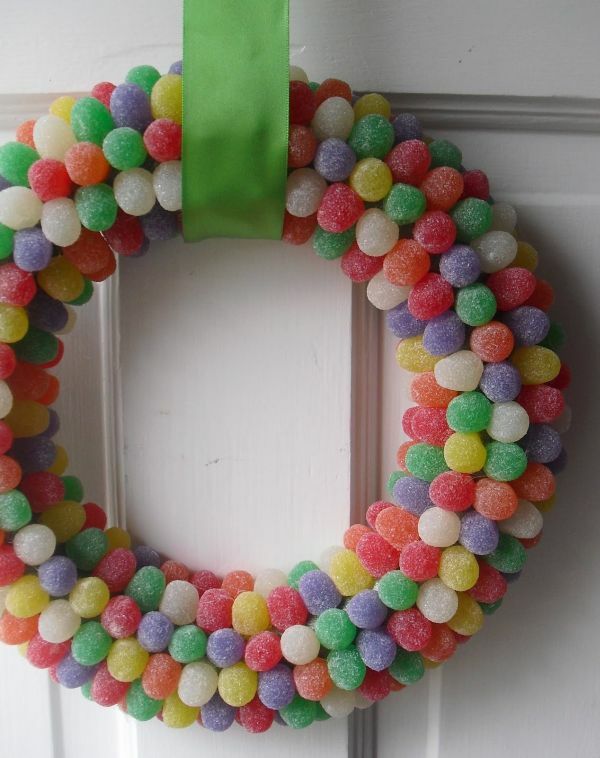 you can even just make a green and red wreath or any color wreath you choose. 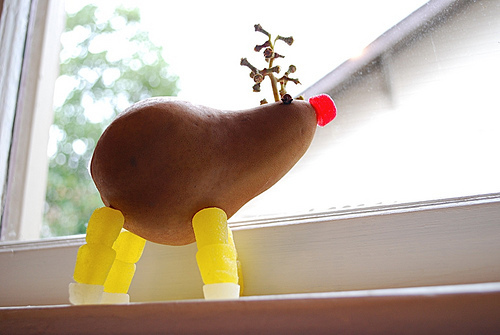 The Lead Chandelier created this adorable Rudolph the Reindeer out of a pear…. hence the name Rudolph the Red Nosed Rein-Pear. I love the idea!! It is super cute and the kids will love making it along with you. Use it as a yummy Christmas decoration. Oh these are so festive!! And, I bet delicious too. Betty Crocker Recipes gives you all the yummy details on this edible Christmas craft. 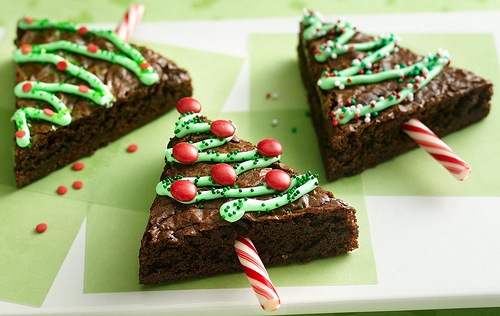 I love the miniature candy canes that are stuck into the brownie as a tree stand… it’s just so creative. 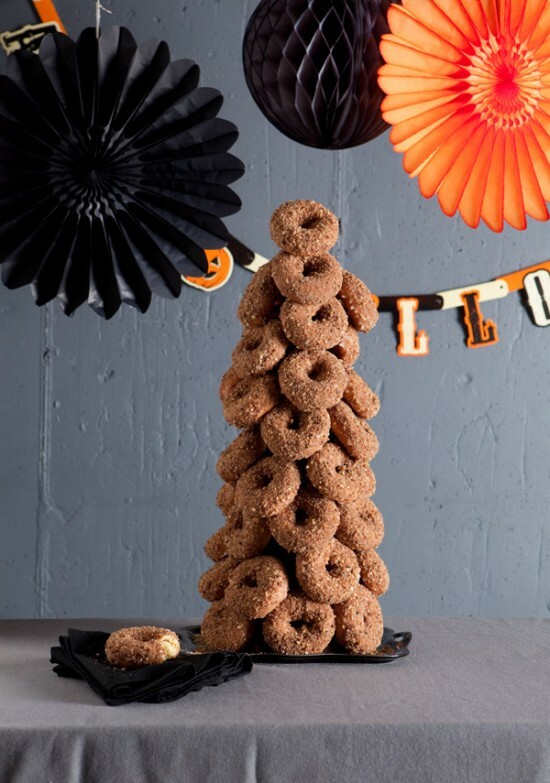 I know this Donut Tree was used at a Halloween party. But, I was thinking…. imagine how wonderful this tree would be if it was white powered donuts!! It would be perfect as a Donut Christmas Tree for a Christmas Party. Check out One Charming Party for all the details. Oh my kids would love this!! After all, they love Krispie Treats. 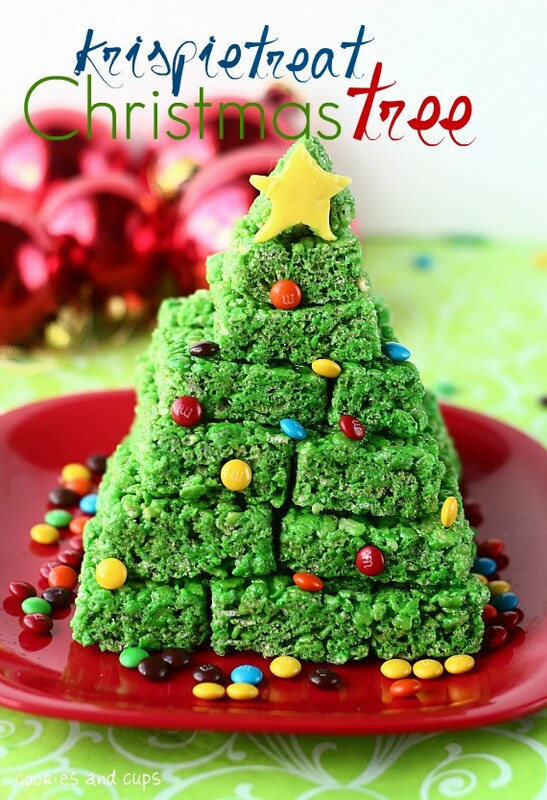 Here Cookies & Cups takes some green food coloring and transforms ordinary looking Krispie Treats into a beautiful green Christmas tree. Add some M&M’s and imagination and your Holiday Christmas tree is born. These adorable bite-size brownies look so tasty…. and so festive too!! I would have no doubt that they would be a huge hit at any Christmas party. Erica’s Sweet Tooth shows you how you too can make this yummy edible Christmas craft for yourself. 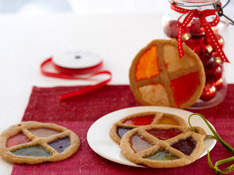 If you are looking for something yummy and festive to serve your guests at your Christmas party that isn’t sweet…. this is the edible Christmas craft for you. 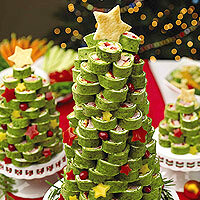 Better Homes & Gardens shows you how to take mini-wraps or tortillas and create a Christmas Tree. Let the guests at your party pick at the tree until it’s gone. Yummy! !